Now my trip is becoming real... The day after tomorrow I will be on a plane, then a train and then to the Chateau. I have been emailing with some of the ladies going and found 2 that will be on the same train! When I signed up for the trip Kaari sent out a gold rooster pin. She suggests we wear it to find other people on our trip. Excited. The Sun Also Rises... One of the greatest novels of all time. You are a gal after my own heart, indeed. whoohoo!! this is so exciting!! Fun, Fun!! Looks like a good mix - can't wait to hear all about it!! you are going to have such an amazing adventure! i wish i had as much courage as you to travel alone and do this type of stuff. i admire you so much! can't wait to hear ALL about it. i say when you get back and settled, we need another bloggers convention to hear all about your trip! safe travels!! super jealous!! i hope you have an absolute blast! I am so happy for you! My two favorite things (that I can see) that you have packed are the fun family photos, and what looks like an orange gingham scarf. Have fun. FREE BIRD! I am so jealous and excited for you!! Love that you're bringing a photobooth pic - i do that too!! I know you are going to have the most amazing time! Lucky for me, I was able to finally meet you and indulge in your aura of pure goodness and creativity for a brief period ~ thank you! You look so well-prepared. 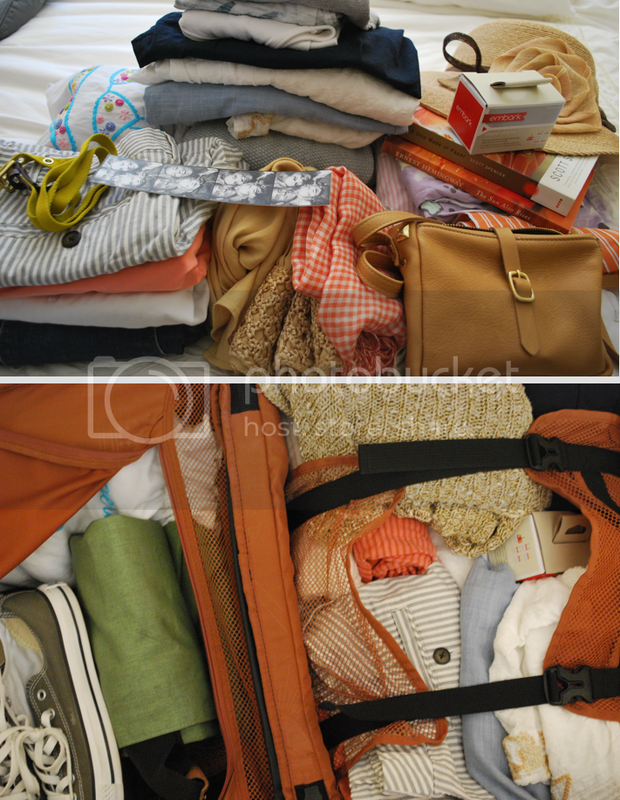 Did you notice the lovely earthy color palette in your suitcase? Who packs photogenically?? Not me! Very excited for you. Take a million pictures! Looks like a really exciting trip! I hope you tell us about it when you return.